Whether you are looking for a champion or just a good companion, all dogs need some sort of training. "The Playyard" believes that a properly trained dog is essential to having a healthy community. Many of our customers want their dogs to walk nicely on a leash, and/or not jump on friends as they come into their home. George and Susan offer good positive training using solid training principles. If you are looking for a social environment that is safe and fun, come train your dog at "The Playyard". George and Susan have been members of The Animal Behavioral Alumni, The Association of Professional Dog Trainers, The National Association of Professional Pet Sitters, Life Abundance Pet Products , The Better Business Bureau, and the Columbia County Chamber of Commerce since 2003. 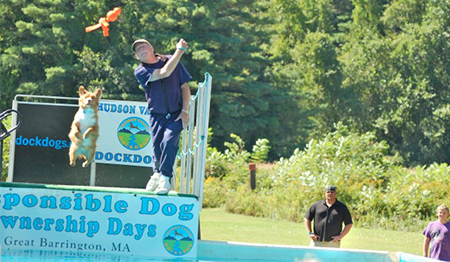 They have recently become involved with the Great Barrington Kennel club. George and Susan have a good reputation with the local veterinarians as well. All dogs are required to be up to date with all medical vaccinations. "The Playyard" is a boarding facility and requires all dogs to have the kennel cough vaccination. Medical documentation is required. The Playyard offers Puppy training, Socialization, Canine Good Citizen, Basic and Advanced Obedience training, Clicker training, and some Behavioral training. Both private and group classes are available. We also offer Agility training in the Spring, Summer, and Fall seasons. 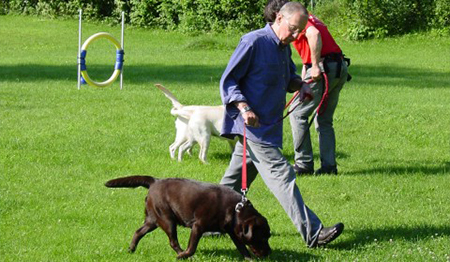 Basic Obedience, Obedience, Advanced Obediance, Agility, Canine Good Citizen, and Clicker training. We also do "Train and Board" with dogs that are not aggressive for $25 per day. Training can also be done in the comfort of your home. Call 518-764-1320 for an appointment and/or upcoming class schedules.